Nonribosomal peptides (NRP) are a class of peptide secondary metabolites which can function as antibiotics. Nonribosomal peptides are produced by microorganisms like bacteria and fungi but are also found in higher organisms such as nudibranchs where they are thought to be made by bacteria inside these organisms. Nonribosomal peptides are synthesized by nonribosomal peptide synthetases, which, unlike the ribosomes, are independent of messenger RNA. The biosynthesis of nonribosomal peptides shares characteristics with the polyketide and fatty acid biosynthesis. peptide: A class of organic compounds consisting of various numbers of amino acids, in which the amine of one is reacted with the carboxylic acid of the next to form an amide bond. metabolite: Any substance produced by, or taking part in, a metabolic reaction. siderophores: Sidereophores are small, high-affinity iron chelating compounds secreted by microorganisms such as bacteria and fungi, and also grasses. Siderophores are amongst the strongest soluble Fe3+ binding agents known. Nonribosomal peptides (NRP) are a class of peptide secondary metabolites, usually produced by microorganisms like bacteria and fungi. Nonribosomal peptides are also found in higher organisms (such as nudibranchs) but are thought to be made by bacteria inside these organisms. While there exists a wide range of peptides that are not synthesized by ribosomes, the term nonribosomal peptide typically refers to a very specific set of these as discussed in this article. Nonribosomal peptides are synthesized by nonribosomal peptide synthetases, which, unlike the ribosomes, are independent of messenger RNA. Each nonribosomal peptide synthetase can synthesize only one type of peptide. Nonribosomal peptides often have a cyclic and/or branched structures, can contain non-proteinogenic amino acids including D-amino acids, carry modifications like N-methyl and N-formyl groups, or are glycosylated, acylated, halogenated, or hydroxylated. Cyclization of amino acids against the peptide “backbone” is often performed, resulting in oxazolines and thiazolines; these can be further oxidized or reduced. On occasion, dehydration is performed on serines, resulting in dehydroalanine. This is just a sampling of the various manipulations and variations that nonribosomal peptides can perform. 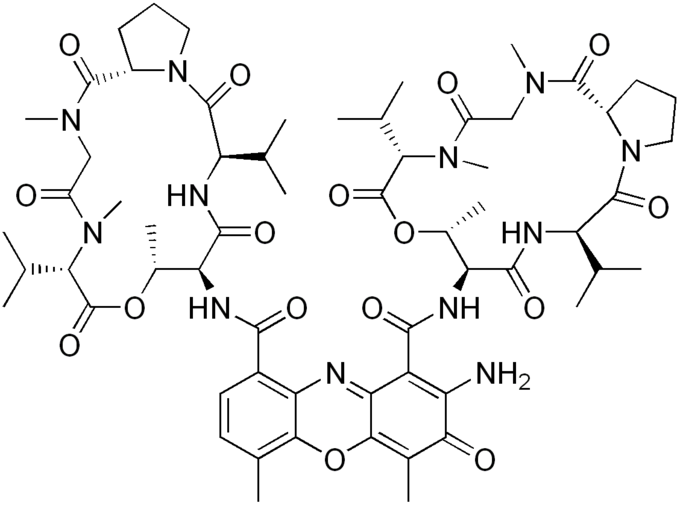 Nonribosomal peptides are often dimers or trimers of identical sequences chained together or cyclized, or even branched. Actinomycin D: Actinomycin D (also known generically as Actinomycin or Dactinomycin), is the most significant member of actinomycines, which are a class of polypeptide antibiotics isolated from soil bacteria of the genus Streptomyces. As one of the older chemotherapy drugs, it has been used for many years. Nonribosomal peptides are a very diverse family of natural products with an extremely broad range of biological activities and pharmacological properties. They are often toxins, siderophores, or pigments. Nonribosomal peptide antibiotics (for example, actinomycin D ), cytostatics, and immunosuppressants are used commercially. Nonribosomal peptides are synthesized by one or more specialized nonribosomal peptide-synthetase (NRPS) enzymes. The NRPS genes for a certain peptide are usually organized in one operon in bacteria and in gene clusters in eukaryotes. However the first fungal NRP to be found was ciclosporin. It is synthesized by a single 1.6MDa NRPS. The enzymes are organized in modules that are responsible for the introduction of one additional amino acid. Each module consists of several domains with defined functions, separated by short spacer regions of about 15 amino acids. The biosynthesis of nonribosomal peptides shares characteristics with the polyketide and fatty acid biosynthesis. Due to these structural and mechanistic similarities, some nonribosomal peptide synthetases contain polyketide synthase modules for the insertion of acetate or propionate-derived subunits into the peptide chain.